Thickness of your soup will depend how much stock you add. Second is soaking the beans overnight. DO NOT ATTEMPT to make bean soup without this important step unless you wish to contribute to the depletion of the planet's ozone layer due to uncontrolled gases! I put my beans in a colander and then place that in a large bowl and fill it with water several hours before going to bed. Then I lift out the colander, throw out the water, rinse the beans, and fill the bowl with water yet again. I do this several times. It will make your beans much more "friendly." I love sweet vermouth with bean soup. Sweet vermouth is like the taste of autumn and complements the soup. You may omit it. If you do, just add one cup more stock. It's important to let the soup simmer for several hours and even more important to taste it periodically. Keep some extra ham stock on hand (or a can of chicken stock) to add if the soup becomes too thick. Like most soups, this improves with age and is even better the next day. I like to sprinkle fresh Parmesan cheese on top of each bowl when I serve it. I always served a pot of this soup at my autumn open house at my art studio along with apple crisp. They were both always a smashing hit. 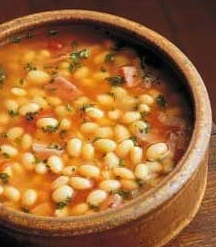 Combine the soaked beans, stock, veggies, ham and seasonings in a large stockpot and bring to a slow boil. Reduce heat to low and simmer, covered for two hours. After two hours, taste for seasonings. Add the ham hock or ham shank, the cloves and a pinch or two of the red pepper flakes if desired. Stir. Add more stock if necessary. Cover and continue to simmer for another hour or two, longer if you have the time. After several hours, remove the cloves, the bay leaf, and the ham hock or shank. Ladle into bowls and enjoy. I never add salt to a ham-based dish since ham is usually pretty salty to begin with. If you don't have extra ham for the soup, have the deli counter cut you several one-half inch slices. "Ham Off the Bone" is a common deli cut that works well. I love using wines in cooking so this will be a recipe I will like I'm sure! Again - great to see you back! I like to eat it but the "several steps?" - no thanks. That would have me spending way too much time in the kitchen.